I have been MIA for a few months while I moved. It was a big move for us as we have moved to the Virgin Islands. I am very happy now to be back in a kitchen and cooking again. Though there is not the fall weather here that I love, nor anything pumpkin spiced, I want to be able to enjoy it. I am not a person who wants everything to taste like pumpkin spice, but I do enjoy it in a coffee creamer. 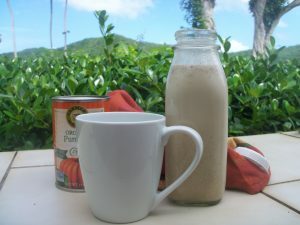 This creamer is simple and quick to prepare and tastes so delicious you won’t need a store-bought brand that has unwanted ingredients in it. Remember to adjust the amounts of each spice to your taste. Enjoy! Bring the half and half to a low boil and whisk in the remaining ingredients. Continue to whisk for a minute or two for thickening. Cool and keep refrigerated for about a week or two. Shake before each use as some ingredients settle to the bottom.